Irn-Bru (/aɪərn bruː/ "iron brew") is a Scottish carbonated soft drink, often described as "Scotland's other national drink" (after whisky). It is produced in Westfield, Cumbernauld, North Lanarkshire, by A.G. Barr of Glasgow, since moving out of their Parkhead factory in the mid-2000s. In 2011, Irn Bru closed their factory in Mansfield, making the Westfield plant in Cumbernauld the main location for production. In addition to being sold throughout the United Kingdom, Barr's Irn-Bru is available throughout the world and can usually be purchased where there is a significant community of people from Scotland. Innovative and sometimes controversial marketing campaigns have kept it as the number one selling soft drink in Scotland, where it competes directly with global brands such as Coca-Cola and Pepsi. Irn-Bru is known for its bright orange colour. As of 1999 it contained 0.002% of ammonium ferric citrate, sugar, 32 flavouring agents including caffeine and quinine (but not in Australia), and two controversial colourings (Sunset Yellow FCF and Ponceau 4R). On 27 January 2010, A.G. Barr agreed to a Food Standards Agency voluntary ban on these two colourings although no date was set for their replacement. 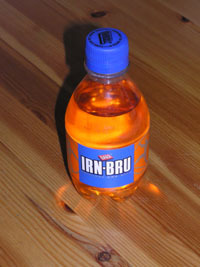 However, after lobbying by First Minister of Scotland Alex Salmond, a proposed restriction of Sunset Yellow to 10 mg was eased to 20 mg in 2011 — the same amount present in Irn Bru. As of May 2017, Irn-Bru still contains these colourings. The first Iron Brew drink was produced by the Maas & Waldstein chemicals company of New York in 1889 under the name IRONBREW. The drink was popular across North America and was widely copied. A similar beverage was launched in 1898 by London essence firm Stevenson & Howell who supplied soft drinks manufacturers in the UK and colonies. Following this date many local bottlers around the UK began selling their own version of the beverage. Despite the official launch date for Barr's Iron Brew being given as 1901, the firms AG Barr & Co (Glasgow) and Robert Barr (Falkirk) jointly launched their own Iron Brew drink at least two years earlier, according to a document in the firm's own archives which indicates that the drink was already enjoying strong sales by May 1899. The strongman image which Barr's adopted for their bottle labels and advertising had in fact been trademarked by the firm Stevenson & Howell in 1898. Barr's ordered their labels directly from Stevenson & Howell who also sold Barr's many of the individual flavours with which they mixed their own drinks. An advertisement for Barr's Iron Brew dated 1900 featuring the original strongman label can be found in Falkirk's Local History Archives. 1980 saw the introduction of Low Calorie Irn-Bru: this was re-launched in 1991 as Diet Irn-Bru and again in 2011 as Irn-Bru Sugar Free. The Irn-Bru 32 energy drink variant was launched in 2006. It has long been the most popular soft drink in Scotland, with Coca-Cola second, but competition between the two brands has brought their sales to roughly equal levels. It is also the third best selling soft drink in the UK, after Coca-Cola and Pepsi, outselling high-profile brands such as Fanta, Dr Pepper, Sprite and 7-Up. This success in defending its home market (a feat claimed only by Irn-Bru, Inca Kola and Thums Up; Thums Up sold out to Coca-Cola in 1993, and Inka Kola owners Corporación Lindley S.A. entered into a joint venture with Coca-Cola in 1999, giving up all rights to the name outside Peru) led to ongoing speculation that Coca-Cola, PepsiCo, Inc. or its UK brand franchisee Britvic would attempt to buy A.G. Barr. In November 2012 AG Barr and Britvic announced a merger proposal, in July 2013 the merger collapsed when terms could not be agreed. Irn-Bru's advertising slogans used to be 'Scotland's other National Drink', referring to whisky, and 'Made in Scotland from girders', a reference to the rusty colour of the drink; though the closest one can come to substantiating this claim is the 0.002% ammonium ferric citrate listed in the ingredients. A limited edition Irn-Bru was released in autumn 2011. Packaged with a black and orange design, and with the signature man icon with an added image of a fire, Fiery Irn-Bru, had a warm, tingly feeling in the mouth once drunk. It featured the traditional Irn-Bru flavour with an aftertaste similar to ginger. Irn-Bru was also sold in reusable 750 ml glass bottles which, like other Barr's drinks, were able to be returned to the manufacturer in exchange for a 30 pence (previously 20p) deposit paid on purchase. This scheme was widely available in shops across Scotland and led to the colloquial term for an empty: a "glass cheque". As a result of a 40% drop in returned bottles since the 90s Barr deemed the washing and re-filling process uneconomical, and on 1 January 2016 ceased the scheme. 2016 saw the introduction the current logo, conveying strength and an industrial feel, and a new diet variant IRN-BRU Xtra in different branding to the existing sugar free variety in a similar fashion to Coca-Cola Zero and Pepsi Max. Barr changed the formula of Irn-Bru in January 2018 in response to a sugar tax implemented in the UK in April 2018, intended to combat obesity. By reducing the sugar content to less than 5g per 100ml, Barr has made Irn-Bru exempt from the tax. The manufacturer asserts that most people will not be able to tell the difference in flavour between the old and new formulas, but fans of the drink have started the 'Save Real Irn-Bru' campaign to stop or reverse this change, and have been stocking up on the more sugary formula. Irn-Bru and other Barr brands including Pineappleade, Cream Soda, Tizer, Red Kola, Barr Cola, and Limeade are still available in 750 ml reusable glass bottles. The most popular plastic bottle size is 500 ml. In May 2007, A.G Barr re-designed the Irn-Bru Can and Bottle Logos. In April 2016, A.G Barr released the redesigned Irn-Bru Can and Bottle Logos. Barr's actively promoted their Irn Bru from the outset, with some of their earliest ads featuring world champion wrestlers and Highland Games athletes Donald Dinnie and Alex Munro who endorsed the drink by means of personal testimonials. In the 1930s, the firm began a long-running series of comic strip ads entitled "The Adventures of Ba-Bru" which ran in various local papers from April 1939 until October 1970. The last traces of this campaign, a large neon sign featuring Ba-Bru which stood in Union St above Glasgow Central railway station, was removed in 1983 and replaced with an illuminated display featuring the tagline "Your Other National Drink". Barr has a long-established gimmick associating Irn-Bru with Scottishness, stemming from the claim of it being Scotland's most popular soft drink. A tagline, "Made in Scotland from girders", was used for several years from the 1980s, usually featuring Irn-Bru drinkers becoming unusually strong, durable or magnetic. A new advertising campaign launched in Spring 2000 which "dramatises the extraordinary appeal of Irn-Bru in a likeably maverick style" Emma Jardine, Account Director, says: "The ads will more than live up to people's expectations of Irn-Bru's continuously humorous campaign." while David Amers, Planning Director, says: "Irn-Bru is the likeable maverick of the soft drinks market and these ads perfectly capture the brand's spirit." One involved a grandfather (played by actor Robert Wilson) who removed his false teeth to spoil his grandson's interest in his can of Irn-Bru. A further TV advertisement featured a senior citizen in a motorised wheelchair robbing a local shopping market of a supply of Irn-Bru. In 2004 Irn created a new concept "Phenomenal"  In 2006 the company launched its first Christmas adverts. This campaign consisted of a parody commercial of a popular Christmas Cartoon, The Snowman, and was effective in interesting American audiences in the Irn-Bru brand. Further advertising campaigns for Irn-Bru appeared in conjunction with the release of Irn-Bru 32 in 2006. A 2009 advertisement for the product features a group of high school pupils performing a musical number, with the refrain "It's fizzy, it's ginger, it's phenomenal!" It is a parody of High School Musical, and stars Jack Lowden. In 2012 the company changed its slogan to "gets you through", which see a number of people drinking irn bru to get through tough situations. In response to the Coca-Cola 'Share a Coke' campaign, Barr decided to produce thousands of limited edition 750 ml bottles of Irn-Bru with the names 'Fanny', 'Senga', 'Rab' and 'Tam' on the label, mimicking that by Coca Cola. The use of the name 'Fanny' ties in with one of Irn-Bru's controversial marketing advertisements. In December 2018, 12 years after the original christmas advert left off, with the child being in a snow bank in Edinburgh, returned to the screens as a sequel which involved the child taking a Seaplane to chase down the Snowman who had his Irn Bru. In the end, the drink gets stolen by Santa. One of the most controversial Irn-Bru television adverts evoked 1950s entertainment. A mother plays the piano, while the father and two children deliver a song which ends with the mother singing: "...even though I used to be a man". This advertisement was broadcast in 2000, but when it was repeated in 2003, it led to seventeen complaints about it being offensive to members of the transgender community. Issue A14 of the Ofcom Advertising Complaints bulletin reports that the children's response to their mother's claim was not offensive. The advertisement was meant to be a joke about changing points of view over time. However, the scene involving the mother shaving at the end of the advertisement was deemed to be potentially offensive to transgender people, and so it was taken off the air. In 2003, an Irn-Bru commercial which showed a midwife trying to entice a baby from its mother's womb during a difficult delivery sparked fifty complaints. Some saw it as upsetting to women who had suffered miscarriages. One billboard that drew criticism featured a young woman in a bikini along with the slogan "Diet Irn-Bru. I never knew 4 1⁄2 inches [11 cm] could give so much pleasure". Another featured a picture of a cow with the slogan "When I'm a burger, I want to be washed down with Irn-Bru". This billboard resulted in over 700 complaints but was cleared by advertisement watchdogs. A billboard which featured a depressed goth and the slogan "Cheer up Goth. Have an Irn Bru." was also criticised for inciting bullying. McCowan's also produced Irn-Bru Bars, chewy, fizzy, bright orange confectionery bars which taste very strongly of Irn-Bru, though production ended in late 2005. Irn-Bru sorbet is available in some speciality ice cream shops in Scotland. The drink can be used as a mixer with alcoholic beverages, mainly vodka and whisky. Barr launched an alcopop drink combining Irn-Bru and Bell's whisky, although this proved to be unpopular and was discontinued. A later attempt came in the form of an official Irn-Bru flavour in the Red Square line-up of vodka-based drinks; this too has been discontinued. WKD Original Vodka sell a "Vodka Iron Brew" drink. Irn-Bru is manufactured in five factories in Russia, and since May 2008 in Norway. Bru and other Barr products are exported to Spain, the Netherlands, Germany, Gibraltar, Greece and Cyprus, as well as parts of Africa and Asia. It is available in the Republic of Ireland, increasingly being stocked in BWG and ADM Londis supplied stores, as well as in supermarkets owned by Dunnes Stores and Tesco Ireland. In Ireland generally, the drink mainly sells in Ulster, chiefly in Northern Ireland and County Donegal. It is also available in Malta, Belgium and, as of 2005, in Poland. It is now sold in Iceland, as of 2011. A similarly named product, using the Iron Brew spelling but bearing little resemblance to Irn-Bru in flavour, colour or packaging, is produced by Coca-Cola in South Africa. In Australia, Irn-Bru was manufactured and distributed under licence by Occasio Australia Pty Ltd until 2009. It was available in 500 ml and 1.25 litre in both standard and diet. The drink enjoyed growing success in the country, with its first advertising campaign launched in Queensland in September 2007. It was initially available in major chains such as Coles and Woolworths, Caltex service stations and in many independent grocers and convenience stores. It was then delisted at Coles supermarkets. Because of manufacturing and bottling issues, Occasio ceased local production in late 2009. It is now imported direct from the UK and distributed by British Provender Pty Ltd, and can again be found in the international sections of major supermarket chains and some convenience stores. Irn-Bru sold in Canada contained no caffeine until recently. In March 2010, Health Canada repealed the ban on caffeine on clear coloured soft drinks and now bottles of Irn-Bru have the label 'Now Contains caffeine' on the packaging. Irn-Bru in Canada is distributed by TFB & Associates Ltd from Markham, Ontario but is packaged by A.G. Barr in Glasgow, Scotland. Irn-Bru can be found at Sobeys supermarkets. The now-defunct McKinlay soft-drink company in Glace Bay, Cape Breton, Nova Scotia, Canada, for many years offered its own non-licensed beverage called Irn Bru and later "Cape Breton's Irn Bru". It was a brown carbonated soft-drink with a fruity cola taste. The standard Irn-Bru distributed in Canada also contains the "Not a source of iron" disclaimer on the label. The UK version of the drink (with caffeine) is commonly imported by speciality retailers, particularly in areas with large Scottish populations. Irn-Bru started being sold at 7-Eleven. It has often appeared in the Danish supermarket 'Netto', 'Rema 1000' and 'Normal'. Today only a few 7-Elevens in Denmark continue distributing Irn-Bru, while most Føtex and Bilka stores now stock Irn Bru. Imported Irn-Bru cans are found throughout Finland in most K-Citymarket locations and some independent stores. Irn-Bru can be found in selected Wellcome supermarkets, in and around areas where the expatriate population is significant such as the Sheung Wan and Central districts. A.G. Barr has launched its Irn-Bru product throughout the Middle East. Found mostly in LuLu supermarkets. Irn-bru is commonly available nationwide from supermarkets as cans and 1.25 litre plastic bottles. It is bottled by Oasis, the same company that bottles Coca-Cola. Imported Irn-bru from Scotland is available from speciality stores. Irn-Bru entered the Norwegian market in May 2008. They had to withdraw from the market again in 2009 as a result of problems with production agreements and lack of funding for marketing. They were believed to be sponsoring the Norwegian First Division club Mjøndalen IF in 2009. This later turned out to be fraud carried out by a third party company, and Mjøndalen IF never received any sponsorship from Irn-Bru, even though the team played the 2009 season with Irn-Bru logo on their shirts. Irn-Bru began being sold in Russia in 1997, and by 2002 it had become their third best selling soft drink. After its original bottler went out of business, a new deal was signed for the drink to be manufactured and distributed in larger quantities by the Pepsi Bottling Group of Russia in 2002. Its popularity has been attributed to the drink's apparent similarity to discontinued Soviet-era soft drinks. As of 2011, Irn-Bru sales in Russia were still growing. Irn-Bru and Diet Irn-Bru have been formulated since 2002 by A.G. Barr plc to meet the regulations for food colouring of the US Food and Drug Administration (FDA). Ponceau 4R, used in the UK formulation, is prohibited by the FDA. Barr uses alternative food and drink colourants manufactured by a US company approved by the FDA. The product labelling also meets US labelling standards on nutritional information and bar code. Compliant Irn-Bru is solely imported by Great Scot International in Charlotte, North Carolina, who supplies distributors and retailers throughout the US It is supplied in 500 ml PTE bottles and 4 pack 330ml cans. ^ Brooks, Libby (30 May 2007). "Alongside penicillin, tarmacadam and the bicycle, there is another Scottish invention that has genuinely rocked the world: Irn Bru". The Guardian. London. Retrieved 5 February 2012. ^ "During the years Irn-Bru has been advertised as "Scotland's other National Drink", referring to whisky". Sky News. 27 May 2009. Retrieved 5 February 2012. ^ "AG Barr to replace colourings in Irn-Bru". just-drinks. 28 January 2010. ^ Bolger, Andrew (9 September 2011). "EU reprieve for Scottish soft drink Irn-Bru". Financial Times. Retrieved 5 May 2017. ^ "The Guilty Suspects". Irn-Bru. AG Barr. Archived from the original on 5 May 2017. ^ a b c d e Leishman, David (2017). ""Original and Best"? How Barr's Irn-Bru Became a Scottish Icon". Etudes écossaises. 19 – via OpenEdition. ^ "Iron Brew Showcard registered in 1898 by Stevenson & Howell (Reference: 1 143 002)". National Archives. 1898. ^ The Falkirk Cookery Book. Falkirk: John Callander. 1900. pp. Back page. ^ "The Adventures of Ba-Bru: The new way Mr Barr spells Irn-Bru". Motherwell Times. 21 May 1948. ^ The Advertising, Labelling and Composition of Food. HMSO: Ministry of Food. 1949. pp. 46–48. ^ "Coke takes sparkle from Irn-Bru". The Scotsman. 30 September 2003. ^ Hosie, Rachel. "Irn-Bru: 15 things you didn't know about Scotland's national drink". The Independent. Retrieved 1 August 2018. ^ Flanagan, Martin. "AG Barr-Britvic merger could see 500 jobs axed – Management". Scotsman.com. Retrieved 14 November 2012. ^ "Britvic, A.G. Barr merger deal collapses". Reuters. 11 July 2013. ^ a b "The end of the 'glass cheque': Irn-Bru stops bottle return scheme | Scotland". News. 30 December 2015. Retrieved 9 January 2016. ^ a b Gillan, Audrey. "Cash in your 'glass cheques': the end of the Irn Bru buy-back scheme is nigh | Life and style". The Guardian. Retrieved 9 January 2016. ^ "Irn Bru maker AG Barr signals end to bottle returns - BBC News". Bbc.co.uk. Retrieved 9 January 2016. ^ "Fizzy drink Irn-Bru gets sparkling new branding and packaging design". Design Week. 3 May 2016. Retrieved 5 December 2017. ^ "AG Barr reveals Irn-Bru Xtra as part of its new marketing strategy following sugar tax". The Drum. 24 July 2016. Retrieved 2 December 2017. ^ "Irn-Bru XTRA is finally here and this is where you can buy it". The Scotsman. 19 August 2016. Retrieved 2 December 2017. ^ Wood, Zoe (5 January 2018). "Coca-Cola to sell smaller bottles at higher prices in response to sugar tax". The Guardian. ISSN 0261-3077. Retrieved 8 January 2018. ^ Karasz, Palko (5 January 2018). "Irn Bru, a Scottish Favorite, Loses Some Sugar". The New York Times. ISSN 0261-3077. Retrieved 15 January 2018. ^ Association, Press (5 January 2018). "Irn-Bru drinkers won't notice halved sugar content, claims AG Barr". The Guardian. ISSN 0261-3077. Retrieved 8 January 2018. ^ Barr & Jephcott (2001). Robert Barr 1875 to 2001 AG Barr plc. Macclesfield: Pentagraph. ^ "The Adventures of Ba-Bru: Three-legged race". Evening Times. 19 October 1970. ^ "It's time for a change in city's landmark". Glasgow Herald. 13 July 1983. ^ "Irn Bru Snowman Advert". YouTube. 1 December 2006. Retrieved 14 November 2012. ^ "IRN-BRU Musical ad". Youtube.com. 30 April 2009. Retrieved 14 November 2012. ^ Archibald, Ben (19 June 2013). "Fanny business: Thousands of cheeky Irn Bru bottles on sale | The Sun". Thescottishsun.co.uk. Retrieved 29 July 2013. ^ "Irn-Bru Foetus Campaign Leaves TV Viewers Fizzing". The Scotsman. 15 June 2003. ^ "Irn Bru ad leaves bad taste". BBC News. 30 July 2003. Retrieved 6 February 2018. ^ "Irn Bru ad leaves bad taste". BBC News. 30 July 2003. Retrieved 5 May 2010. ^ Loulla-Mae Eleftheriou-Smith (20 September 2011). "Irn-Bru launches 'fiery' limited edition drink". Marketingmagazine.co.uk. Retrieved 14 November 2012. ^ "British Provender Pty Ltd". Britishprovender.com.au. Retrieved 14 November 2012. ^ "Health Canada repeal caffeine ban". Retrieved 27 February 2012. ^ "Irn Bru at Bramble House". Retrieved 4 December 2011. ^ "MIF utsatt for sponsorbløff". dt.no. 2 June 2010. ^ a b "Irn-Bru signs Russian deal". BBC. 29 January 2002. Retrieved 26 January 2016. ^ "AG Barr profits rise as Russia gets a taste for Irn-Bru". Telegraph.co.uk. Retrieved 26 January 2016. Davidson, Alan. Oxford Companion to Food (1999), "Irn-Bru", p. 407. Wikimedia Commons has media related to Irn-Bru.